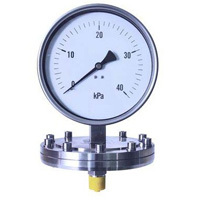 Diaphragm pressure gauge is mainly composed of all-stainless pressure gauge and diaphragm body. The difference between diaphragm pressure gauge and sanitary diaphragm gauge is pressure range. Diaphragm pressure gauge is applicable in chemical industry, food and other fields. And diaphragm pressure gauge is available in corrosive medium and conditions. Differential GaugeDifferential gauge is used to measure the pressure difference under the same conditions. It is mainly used in petrochemical, pipelines and other areas.